Our Day Sailer mainsail is designed with an open leech that makes it easier to de-power, yet still offers plenty of punch for light and lumpy days. The forgiving shape rewards small mainsheet adjustments, which are instantly translated into superior point and speed. Built from a lighter, firmer, 3.8oz coated cloth, this mainsail matches the bend characteristics of most popular Day Sailer masts. 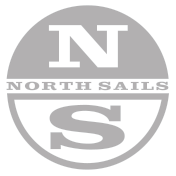 Our Day Sailer jib is an all-purpose sail with a relatively full and powerful entry, to help make the boat easier to steer in light, shifty winds or choppy, wavy conditions. The “wide groove” shape makes it easier for all skippers to get the Day Sailer up to speed quickly. Built from a 4.5 oz coated high performance fabric. The class performance standard when it comes to downwind performance. The Radial Spin flies quicker, is easier to trim and more stable than any Day Sailer spinnaker ever designed. Made out of .5 oz Superlite. The class performance standard when it comes to downwind performance. The Radial Spin flies quicker, is easier to trim and more stable than any Day Sailer spinnaker ever designed. Made out of .75 oz Nylon.